From time to time, we see confusion about carbohydrate foods surfacing online despite scientific and nutrition experts’ clarifications. Remember: Not all carbohydrate foods are the same. As Oldways points out in this recent statement for the media, one more example is a recent article with the headline, “Fatty foods don’t cause heart disease, bread and pasta do,” another disappointing focus on the results from the Prospective Urban Rural Epidemiology (“PURE”) study, that has been discounted by most nutrition scientists and other health professionals. It’s clear that eating an apple is better for you than eating a chocolate chip cookie. Progress in scientific research has highlighted the diverse functions of carbohydrates in the body and their importance in the promotion of good health. The WHO/FAO report on carbohydrates in human nutrition and the scientific opinion on dietary reference values for carbohydrates and dietary fiber from EFSA confirm that carbohydrate-containing foods like pasta are a necessary part of a healthy diet. In fact, 45 to 60 percent of our energy should be coming from carbohydrates. Sticking mostly to healthy carbs like fruits, vegetables, legumes, and grains will help maintain a healthy diet. Made from durum wheat semolina or from the flour of other grains mixed with water and/or eggs, pasta is a simple nutritious way to add the necessary carbohydrates to any healthy diet. 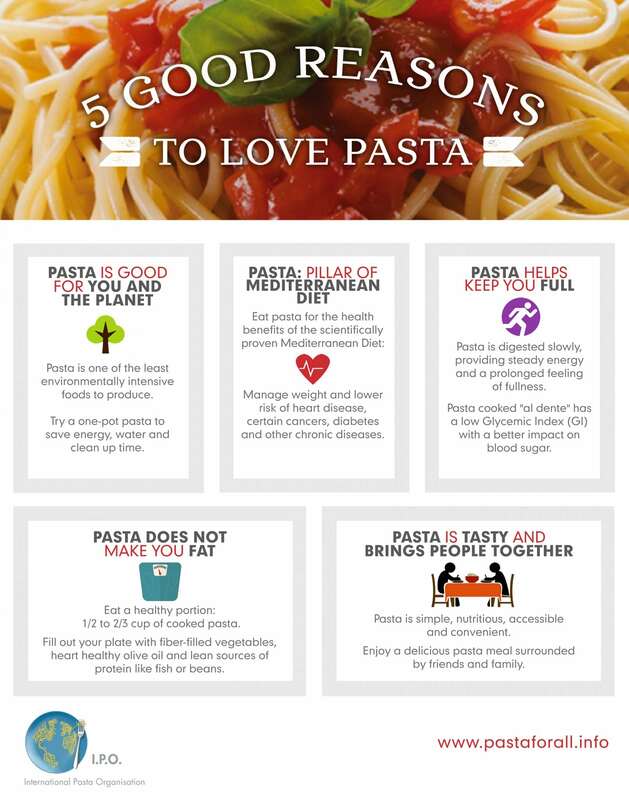 This article by internationally recognized nutrition expert Dr. David Katz provides a science-based explanation of how pasta fits into a healthy diet. Like most of us, he eats pasta because he loves it – and because it fits into a healthy lifestyle.